Looking for an easy vegetarian meal? 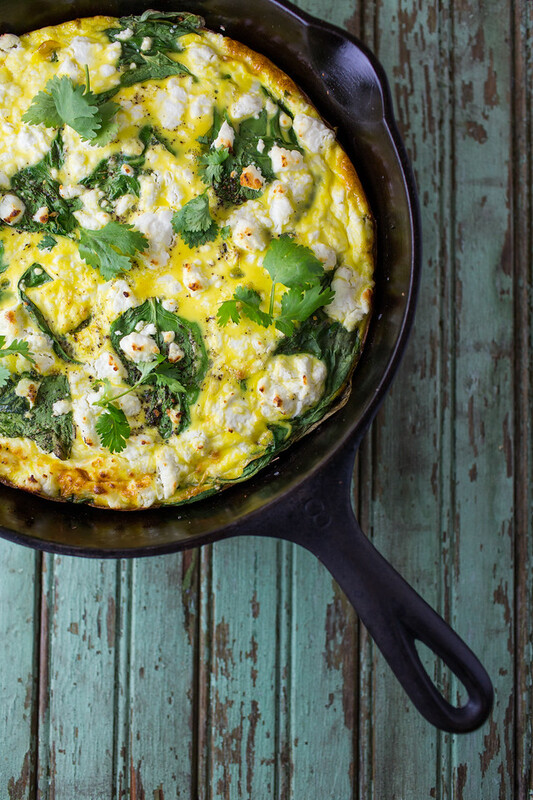 Then you are going to love this Sweet Potato and Baby Spinach Frittata. Sweet potatoes, tangy goat cheese and baby spinach are perfect together in this start on the stove, finish in the oven vegetarian frittata! Click here to pin this Sweet Potato and Baby Spinach Frittata now! 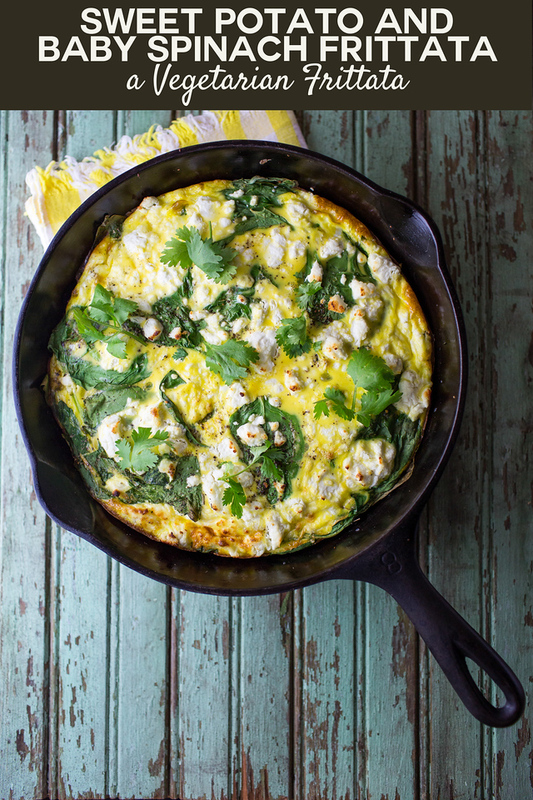 If you don’t know what a frittata is, then let me introduce you to your new best friend! 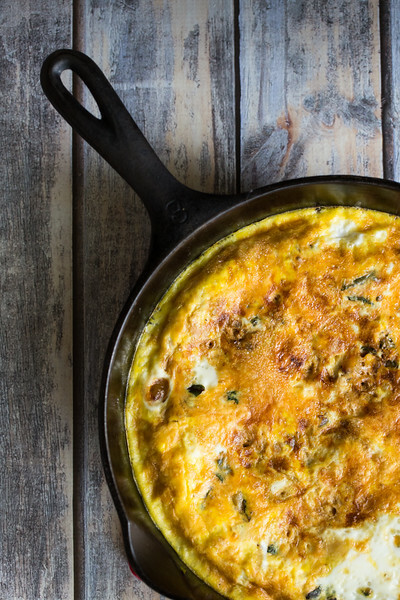 A frittata is sort of an Italian omelet, kind of like a crustless quiche. Unlike an omelet the ingredients are mixed in with the eggs instead of used as a filling. They are typically made in an oven safe skillet because they are started on the stove and finished in the oven. Every single time I make a frittata, I think, “Why don’t we have these more often?” They are so simple and perfect. Now that eggs are no longer bad for you (don’t you love science and all it’s research?) – I am ready to add more eggs to our diet. Frittatas are super easy to make. You can make it entirely on the stove, or in your favorite oven safe skillet for the stove to oven method, or bake the entire frittata in a casserole dish. Personally, I usually use the stove to oven method, however I recently discovered that you can make them in an Instant Pot! With the stove to oven method, you start out precooking your vegetables on the stove. This is also the perfect time to use up some leftover roasted vegetables. I make it a habit to make more roasted vegetables than I need and using the leftovers in a frittata. This Roasted Vegetable Salad with Caper Vinaigrette and this Mahi Mahi with Green Beans and Cherry Tomatoes are both great recipes to make early in the week and use the leftovers in a frittata. Not just leftover vegetables, frittatas are a great way to use up any odds and ends in your refrigerator. They are great way to use up cheese that you have hanging around from other recipes or leftover meats or fish. Leftover cooked salmon is so good in a frittata. We are not vegetarians, but we do try to eat meatless at least once a week, and I turn to vegetarian frittatas a lot because they are such an easy way to get in lots of vegetables in a rich satisfying dinner where you don’t miss the meat! Another favorite way to go meatless is with a risotto – this Instant Pot Risotto can be on the table in less than an hour! Even though I rarely use a specific recipe when making a frittata since I am usually using leftovers, I found the perfect baby spinach and sweet potato recipe in The Sprouted Kitchen: A Tastier Take on Whole Foods . The sweet potatoes are cut into a tiny dice, allowing them to cook and brown. The spinach and green onions are simply wilted on the top of the potatoes, add some cheese and eggs and you have a perfectly simple, perfectly wonderful dinner. We really loved it with hot sauce and the cilantro garnish. An easy vegetarian and gluten free dinner! This Swiss Chard Frittata is another great vegetarian frittata recipe that I make every time I can get some Swiss Chard! 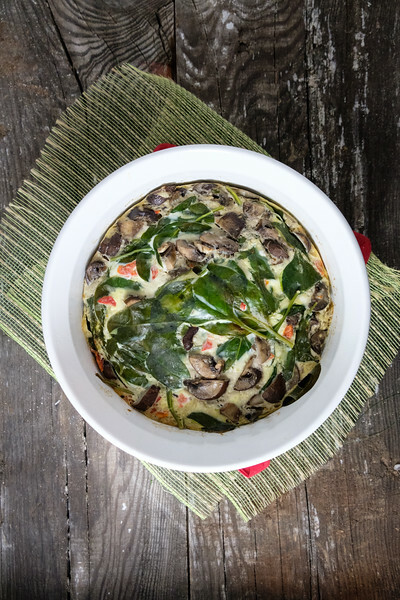 This Frittata with Spinach and Mushrooms is made in an Instant Pot! In a large bowl whisk the eggs, add the milk, a pinch of salt,1/2 teaspoon of pepper and whisk again. Peel the sweet potatoes and cut them in 1/4 inch dice. Heat the oil in a 10-12 inch saute pan (I used my cast iron skillet). Add the potatoes and stir to coat. Sprinkle with the cumin, 1/2 teaspoon salt and the thyme and stir again. Cook the potatoes stirring occasionally until tender and browned - about 10 minutes. Sprinkle the green onions on the top and then the spinach. Let the spinach wilt for about a minute, using a lid to help. Turn the heat to low, whisk the eggs again and pour over the top. Crumble the goat cheese over the top. Place the pan in the oven and bake for 10-12 minutes or until just set. Remove the frittata and let it rest for a couple of minutes before slicing. Sprinkle with more pepper, garnish with cilantro and serve with hot sauce on the side. Yummy. I love meat free meals. Hubby and I would enjoy any and all of these dishes. You would, it’s so good! I love frittata but I’ve never tried one with sweet potato in it before. Sounds like a delicious combination! I love the flavors you got going on in this frittata! WOW!! Looks amazing! You are right! Why don’t we make frittata more often? Perfect for brunch and packs up perfect for take out lunch. Love all the delicious flavors you combined. Sweet potatoes are my favorite! I’m always looking for new ways to use sweet potatoes, Pam, and this recipe looks seriously delicious! Love how wholesome it is as well. Featured on our Hearth and Soul Facebook page. Thank you for sharing it! Thanks so much for sharing this delicious Sweet Potato and Baby Spinach Frittata with us, I just love Sweet Potatoes. Hope you will come back to see us at Full Plate Thursday real soon and have a great week! Frittatas are quite lovely!!! Yours looks perfect. I just printed the recipe, it definitely needs to be a dinner in our house next week. I’m the only one in my house who likes frittata. I couldn’t be happier that eggs are finally being embraced. I love them so. Thanks for sharing this at #SaucySaturdays. Delicious! A couple of nights ago I made a roasted sweet potato, asparagus and feta tart with the first Australian asparagus of the season. Served it with a fresh salad. Very tasty indeed. Oh, I miss asparagus! My favorite part of spring! This is a keeper Pam. My son is gluten and dairy free.. I see this on the Christmas brunch table, although I will be making it before that. Oh yes. A thousand times, yes to this. YUM. This looks so delicious! I also like frittatas and they’re really so versatile, you can eat them any time of day! I never use sweet potato in mine though…I’m going to have to try this combination! This looks delicious! Sweet potatoes, eggs and goat cheese? Yes, please! Yum! I love the idea of goat cheese and sweet potato!